Friday 25th of April 2014, Joe Lawlor and Diarmuid Gavin. 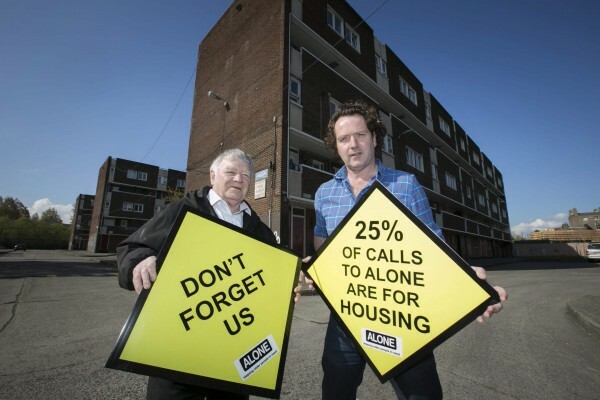 During April and May 2014 we ran a Home Truths Housing Campaign to highlight the housing crisis among the older people that we work with. Although the current housing crisis receives widespread coverage, in ALONE we are very concerned that the issue of homelessness among older people has somewhat been ignored. As well as spreading awareness about this ongoing issue, the main aim of our Home Truths campaign was to get the Government to release boarded properties to ALONE for redevelopment into homes for older people in need. The campaign resulted in ALONE securing 13 new homes for homeless older people. What are the Home Truths? Almost 5,000 older people are on the social housing list – the real figure of those in need of housing is much higher. Older people are not seen as attractive tenants – no fixed income, more likely to remain in the property throughout the day, once they move in they are less likely to leave. 1 in 5 older people in Ireland are homeless, socially isolated, living in deprivation or in crisis. Some of our most vulnerable older people are being left to survive in cold, damp and unsafe houses with no central heating or running water. In Ireland, the over 65’s population is increasing by 20,000 every year. This means that the number of people over 65 is set to double in the next 25 years. With our ageing population, ALONE believes that older people should be supported to live within the community by providing suitable accommodation and home supports. This long-term solution for the accommodation crisis for older people in Ireland makes sense on an individual, social and economic basis. Although the problem is complex, one short term solution that could have immediate results was if the government released the boarded up social housing units for redevelopment into homes for those most in need. ALONE proposed to regenerate these ‘boarded up’ units to provide homes for older people in need. ALONE’s secondary goal was to encourage Dublin City Council to release the property in Jamestown that has been boarded up for 10 years to us. We plan to renovate it and provide homes to the most vulnerable older people who are homeless or at risk of homelessness and need a level of support. 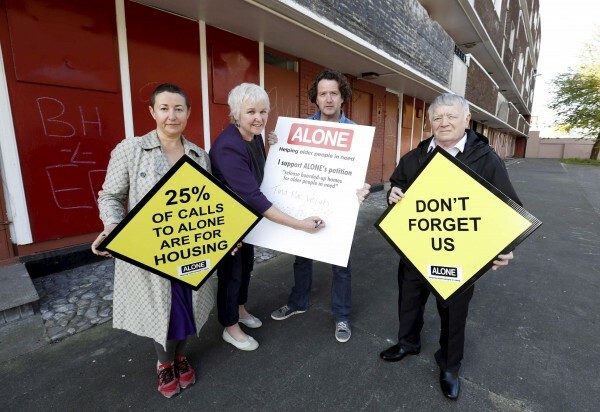 Dublin City Council also released 16 boarded up bedsits to ALONE, which will redevelop into 8 one bedroom apartments for homeless older people. However the work continues. Today the crisis is worse than ever with the number of older people coming to us for housing increasing at an alarming rate. In response to this crisis we have committed to doubling the number of housing units we provide to homeless older people. If you would like to support our work please donate now. 100% of donations go directly to our front line services.